Eccentric TV comic and performance artist who developed a cult following from his pranks and his Saturday Night Live routine. 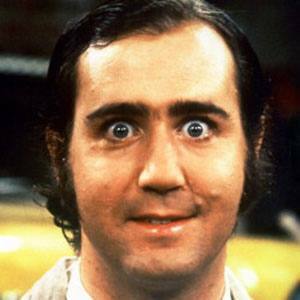 He appeared as the foreigner Latka Gravas on the popular sitcom Taxi from 1978 to 1983. As a child, he would lock himself in his room alone and put on comedy shows for hours at a time. When he started performing professionally he would often play a recording of the theme from the Mighty Mouse cartoon show and lip-sync only the chorus. He performed this routine during the first episode of Saturday Night Live in 1975. For much of his later career he and friend, Bob Zmuda would take turns dressing up as sleazy lounge singer, Tony Clifton, to offend and fool strangers. His daughter, Maria Bellu-Colonna, was born out of wedlock and put up for adoption by her 17-year-old mother in 1969. He never married and died of a rare type of lung cancer. In the 1970s, he would warm up for his impressive Elvis Presley impersonation by posing as a foreign and bumbling comic.